Easily get a tougher vehicle by moving the tie rods and drag links out of the way! The Crane Axle Dana 44 High Steer Interlocking Knuckle Kit will relocate your steering components to a better area. Plus, this Dana 44 Knuckle Kit will cause a huge increase in durability and performance from your Dana 44 knuckles and high steering arms. These are Extreme Duty Dana 44 parts that are 100% made in the USA. Crane Axle’s Extreme Duty Dana 44 Interlocking Outer Knuckles are made from High Strength Nodular Iron. Built from 1018 CR Steel, these Dana 44 High Steer arms were made for superior strength. The interlocking design is a Crane Axle original and takes the pressure off of the High Steer arm stud and instead puts the load on the interlocking keys. You can finally say goodbye to broken Dana 44 High Steer Arm Studs. GM, Ford, Dodge, CJ, and full-size Jeep Dana 44 and GM 10 Bolt front axles from ¼ ton to ¾ ton. 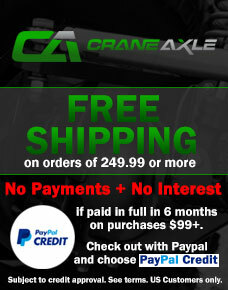 Crane Axle's Dana 44 Steering Arms are piloted with 1/2" holes for ease of locating tie rod and/or drag link holes. They can be tapered to run 3/4 & 1 ton tie rod ends. They can also be drilled to run 5/8" or 3/4" rod ends. Proudly Made In The USA. Crane Axle Knuckles will fit all Dana 44 Steering Axles in combination with our Crane Axle Dana 44 Inner C's. OEM fitment will vary on manufacturer and model. 1972-1976 K5(Blazer/Jimmy)/K10/K20/k30 (passenger side) Some 1977 K5 Blazers came with Dana 44s in the front, others came with a Corporate 10 bolt solid axle.